Landslide is an album from a trio of Dublin based musicians. Together they cover a broad spectrum of sounds. 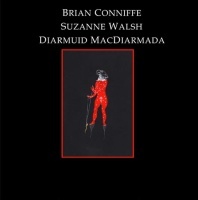 Brian Conniffe is an experimental musician, who has remixed Nurse With Wound, Suzanne Walsh is an artist, musician and writer, while Diarmuid Macdiarmada is a veteran of the Dublin music scene. Together they have created Landslide which is an incredibly fragile recording born from Suzanne Walsh's delicate voice and Brian Conniffe's ambient explorations. Walsh's voice is quietly expressive, moving from spoken tones to singing. The vocals are experimental in their own way and are matched beautifully by the tranquil spaciousness of the music. Conniffe adds shades of atmosphere with a sense of musicality; creating abstract melodies that are inviting and enjoyable even to ears unaccustomed to experimental atmospherics - and that's a remarkable trait. It's something I've not heard since the painterly hues of Torr Lundvall's ambient soundscapes. But while Lundvall works alone, Landslide is the work of three disparate musicians bringing together different approaches. 'Landslide' opens with the warm airy tones of Conniffe's ambient soundscaping	which acts as backing to Walsh's delicate and expressive vocal mannerisms. Her voice is more pensive and poised on 'A Shining Ache' where the synths shimmer, edging slowly forwards into deeper, darker realms. Nothing is overworked by the trio and that's especially true of 'Holy Ground (Short Instrumental Mix)' where they are joined by the esteemed Clodagh Simonds of Fovea Hex, Áine O'Dwyer and David Colohan. Drifting layers gently melt over breathy wordless accompaniment with the angelic plucking of a harp performed faintly by Áine O'Dwyer. As beautiful as it is, you do wonder why we're presented with a short mix rather than the full version. A minor quibble, but on the vinyl release there's certainly room for it. Against chiming keyboards and bells, Walsh's voice soars on 'Beneath White Sheets' in an almost soprano style, joined by a cluster of male voices making this sound like a madrigal group singing in folk ensemble style. Things take a much darker turn on 'Not The Night' where moaning synths give rise to stuttered electronics with the odd touch of bells, before it swells with a tinkling rhythm to the softly sung and spoken tones of Walsh, just as the electronics begin to creak and moan. It's a wonderful combination of dark electronics, pure voice and rhythm. As it progresses Walsh's voice is augmented by some unexpected vocal layers wafting in from each channel, before it slips away on some droning folk pipes. It's worth pointing out that 'Not The Night' features a treated sample from the Coil Reconstruction Kit, two DVDs featuring the instrumental backing tracks (and video projections) from Coil's touring group included in the Colour Sound Oblivion DVD wooden boxset collection. The album is dedicated to the memory of John Balance and Peter Christopherson.